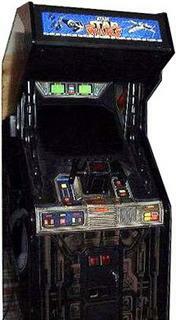 I have great memories of the Atari Star Wars arcade game which was released back in 1983. The video arcade was at the height of its popularity and bearing in mind the first Star Wars movie was released in 1977, it is quite astonishing really that among all the space invader type games of the era, the Atari Star Wars game was the first ever Star Wars arcade game. I remember the first time I came across a cabinet in a seaside arcade, which was the sit down version. I was probably 7 or 8 years old. I climbed inside the cabinet and was immediately dazzled by the seemingly life like 3D graphics. Trust me, in the early-mid Eighties wireframe graphics was 3D! The digitized audio sound effects and actual speech samples also made the game seem real. The fast moving graphics were ground breaking at the time so the game required customized beefed up hardware with separate processors to handle the video and audio. The controller, which didn’t look out of place in an X-wing cockpit, was also inspired ; based on a military version of Battlezone another older game that used wireframe 3D but at a much slower pace. The Star Wars arcade game featured three main sections, a dogfight in space shooting at Tie Fighters, a run across the surface of the Death Star avoiding enemy towers and firing turrets and finally a Death Star Trench run where the pilot has to avoid turret fire and trench structures. At the end of the tench run the player is asked to fire into the Exhaust port and if judged correctly successfully destroying the Death Star. Before the game actually starts, the player is allowed to choose which level of difficulty to begin at, with compensating bonus scores for each higher level of play. Then the battle begins, and the incredibly smooth first person perspective and 3-D effects take over. The steering mechanism and four built-in triggers enable pinpoint shooting and flying accuracy as well as rapid-fire. The four laser-cannons that are located on the sides and bottom of the video monitor hit the cross-hair in the center of the screen, which is controlled by the steering mechanism that also controls the direction of your ship. The mechanism is a good copy of the x-wing firing triggers in the movie. During the game, you are assaulted by fireballs and lasers, which you must destroy or avoid. Each hit on your ship destroys one of your shields. Any collision will also lose you a shield and the game ends when you run out of shields and you get hit. You do, however, receive an additional shield every time you destroy the Death Star. The game featured a dramatic state-of-the-art for the time, color vector graphics system that produces surprisingly realistic effects. The sound track includes familiar voices of Luke Skywalker “Red Five standing by.”, “I cannot shake him!”, “This is Red Five. I’m going in!”, etc., Obi-Wan Kenobi “Use The Force, Luke!”, “Remember, The Force will be with you. Always.”, etc., Han Solo “Yahoo! You are all clear, kid!”, Darth Vader “I have you now!”, “The Force is strong with this one!”, etc., Wedge, and even R2D2 various beeps and electronic sounds, documented in the manual as “Yes”, “No”, “I agree”, “Sequence completed”, “Ouch!”, and “That really hurt.”. There are also seven different musical tunes from the movie that are played throughout the game including the Star Wars Theme, Ben’s Theme and the Mos Eisley Cantina Band’s number. Next PostNext Did You Know Star Wars DL-44 Blasters are Gas Powered? Should Kathleen Kennedy be fired from Lucasfilm? Four Percent Challenge Review here!